Layer salmon with sprigs of fresh dill, cover and simmer until done ( until fork can be inserted with no resistance - 8 plus minutes depending on thickness of your filets.) 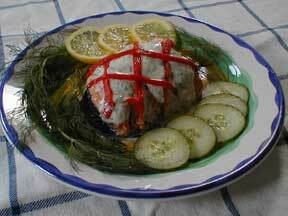 Gently take salmon out of poaching liquid, remove dill, plate and cool. Spoon Key Lime Mayo over filets and decorate with roasted red pepper lattice.